Having been to Canada a couple of times I've noticed the popularity of their whisky, heck I've probably had a few drams on a night out in Toronto as well. 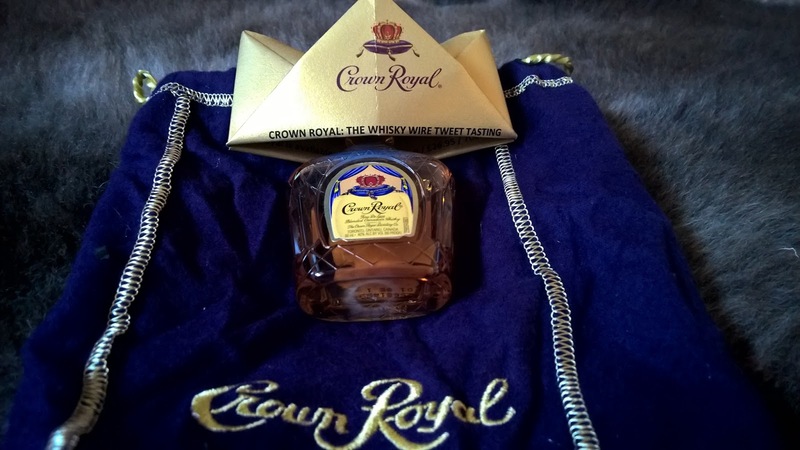 There was no lasting impression so I'm looking forward to this opportunity to experience the Crown Royal Deluxe as part of the latest tweet tasting event organised by the Whisky Wire. Safe in the confines of my own home I can spend a little more time with a dram of the stuff and run through the characteristics and development of the whiskey. What about Crown Royal I hear you ask? Well its origins go back to 1939 and the Royal visit from King George VI who is mentioned on some bottles of White Horse I possess. A memorable blend was put together from 50 whiskies to commemorate the King's visit. Since then it has gone from strength to strength, becoming a massive seller in North America prompting Diageo to snap it up in 2000. Reflecting on that 50 number just for a moment, it's a huge assortment and logistical challenge. Featuring corn, barley and rye whiskies it's a real hybrid of grains. Mixed with seasoned and new white oak barrels before being blended together. The packaging isn't to my taste but there is clearly a market for Crown Royal along with Chivas' Royal Salute. Colour: I'm thinking nuts and specifically walnuts along with some colouring perhaps? Nose: initially a little rugged and sharp on the nose with nutty flavours and it does remind me somewhat of a rye whisky but without the layers of detail. Brown sugar, vanilla and after some ransacking in my memory banks; soggy newspaper wrapping from a poke of chips. A sprinkling of pepper and maple syrup. Taste: in some ways it reminds me of an enhanced Haig Club which represents the bottom feeder of the whisky world. The inclusion of rye elevates it somewhat and breaths life into what would be a very tranquil whiskey. The vanilla wood is very noticeable and inoffensive. Rolling tobacco with an earthy, vegetative quality and dried raisins are the peaks of the experience. An interesting experience and I can see the Crown Royal Deluxe proving popular to the cocktail crowd as a foundation to carry other flavours. My first dram wasn't an memorable experience but then you settle down and it's perfectly drinkable if a little bland and limited. For mixers or newbies to whiskey (or whisky) it's an interesting starting point if the price is right. If you do want a real taste of America and what a 100% rye whisky can achieve then seek out the Wild Buck whiskey from Florida as its truly scrumptious.